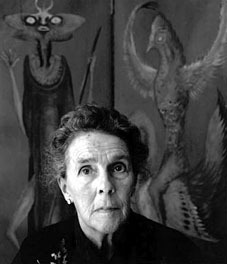 MEXICO CITY—British-born painter, writer and sculptor Leonora Carrington, considered one of the last of the original surrealists, has died, Mexico’s National Arts Council confirmed Thursday. She was 94. Carrington was known for her haunting, dreamlike works that often focused on strange ritual-like scenes with birds, cats, unicorn-like creatures and other animals as onlookers or seeming participants. She was also part of a famous wave of artistic and political emigres who arrived in Mexico in the 1930s and ’40s — and in the male-dominated realm of surrealism, was a member of a rare trio of Mexico-based female surrealists along with Frida Kahlo and Remedios Varo. Friend and promoter Dr. Isaac Masri said she died Wednesday of old age, after being hospitalized. “She had a great life, and a dignified death, as well, without suffering,” he said. Carrington’s body was taken to a Mexico City funeral home for viewing. Mexican author Elena Poniatowska was a longtime friend of the artist and wrote the novel “Leonora” based on her life. “Leonora was truly a woman who was one of a kind,” Poniatowska said. Carrington was born in Lancashire, England, on April 6, 1917, but her last longtime home and inspiration was Mexico, once famously dubbed a “surrealist country” by writer and poet Andre Breton. The artist is survived by two children. Funeral plans were not immediately announced.